Flannels have been flying off the shelves and into our BattleShopper’s‪ ‎Glamping‬ closets this week! Have you had your eye on a gorgeous flannel shirt you haven’t been able to buy yet? Head to BattleShop.co and search for your favorite retailers, then build your dream wardrobe with a virtual $2000 budget. Sure, you’re not actually buying the clothes, but you could compete for AMEX gift cards if you advance in your league. Give it a shot! Today’s the last day to lock’em up for this week’s challenge. Don’t miss your chance at the Finals. Load’em & Lock’em – Sales to help you lock those closets today! It’s that time again BattleShoppers! Another full week of league play is in the books and we’re revved up to see which Road Trippin’ themed closets cruised their way into the Finals! If a closet wins in the first round of Voting Leagues it advances to the Finals on Sunday and Monday. The top three closets each week will win $100, $50 and $25 gift cards so if you’ve still got an unlocked closet, get shopping! You have until Friday at 11:59 pm (EST) to lock a closet each week. Just login, go to your Fitting Room and click the START A NEW BATTLE button. You have 5,000 BattleBucks, or virtual dollars, to shop with. In the mean time, check out our GREAT last minute sales from retailers within our site to get this week’s closet loaded up and locked up! 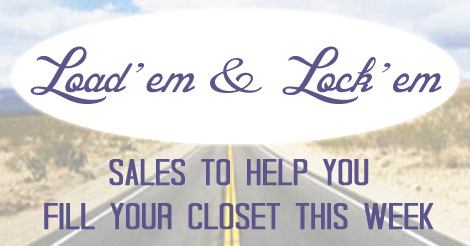 July 18th Load’em & Lock’em – Sales to help you fill those closets! BattleShop is nearing the end of our fourth full week of league play and we’re pumped to see which Nautical Chic themed closets sailed their way into the Finals! If a closet wins in the first round of Voting Leagues it advances to the Finals on Sunday and Monday. The top three closets each week will win $100, $50 and $25 gift cards so if you’ve still got an unlocked closet, get shopping! You have until Friday at 11:59 pm (EST) to lock a closet each week. Just login, go to your Fitting Room and click the START A NEW BATTLE button. You have 5,000 BattleBucks, or virtual dollars, to shop with. In the mean time, check out our GREAT last minute sales from retailers within our site to get this week’s closet loaded up and locked up! Load’em & Lock’em – Sales to help you fill those closets! BattleShop is nearing the end of our third full week of league play and we’re pumped to see which Festival Chic themed closets made their way into the Finals! If a closet wins in the first round of Voting Leagues it advances to the Finals on Sunday and Monday. The top three closets each week will win $100, $50 and $25 gift cards so if you’ve still got an unlocked closet, get shopping! You have until Friday at 11:59 pm (EST) to lock a closet each week. Just login, go to your Fitting Room and click the START A NEW BATTLE button. You have 5,000 BattleBucks, or virtual dollars, to shop with. In the mean time, check out our GREAT last minute sales from retailers within our site to get this week’s closet loaded up and locked up! BattleShop is nearing the end of our second full week of league play and we’re so excited to see more closets making their way into the weekly Finals! If a closet wins in the first round of Voting Leagues it advances to the Finals on Sunday and Monday. The top three closets each week will win $100, $50 and $25 gift cards so if you’ve still got an unlocked closet, get shopping! You have until Friday at 11:59 pm (EST) to lock a closet each week. Just login, go to your Fitting Room and click the START A NEW BATTLE button. You have 5,000 BattleBucks, or virtual dollars, to shop with. In the mean time, check out our last minute picks from retailers within our site to get that closet loaded up and locked up! Rebecca Taylor Printed shorts – Orig. $250, ONSALE $75 Saks Fifth Ave.
Anchor beach tote – Orig. $48, ONSALE $36.99 Need Supply Co.